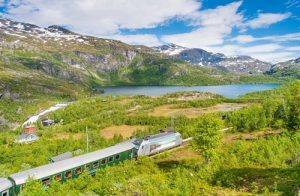 One of the most scenic rail lines in Norway is without doubt Flam Railway. 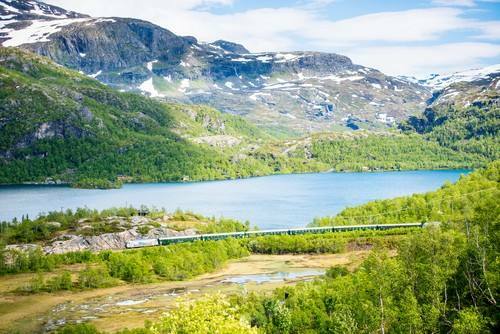 A journey on this rail line is one you will surely never forget. It has been several times named one of the most spectacular rail lines in Europe. It is also one of the steepest railway lines in the world, with 80% of the journey having a gradient of 5,5%. 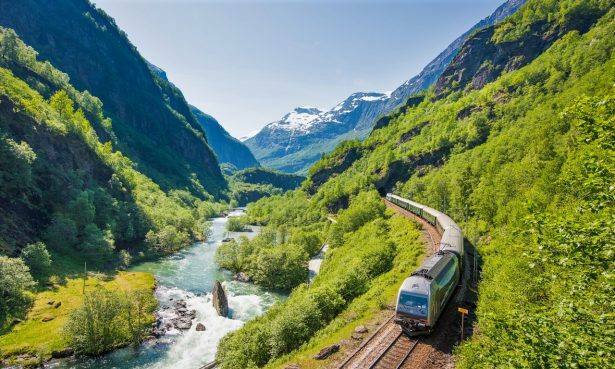 Flam Railway connects the charming village of Flam, on the shores of Sognefjord, with Myrdal mountain station (876 meters above sea level). Myrdal is also a station of the famous Bergen Line, which means that Flam Railway connects with the Oslo-Bergen line. 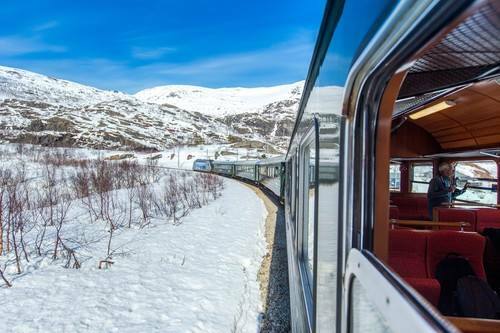 So when you arrive in Myrdal or start your journey in Flam the train will already wait for you: smartly painted in dark green with gold lettering, the carriages have a real vintage feel with wood-panelled walls and chrome luggage racks. 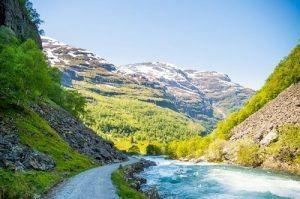 On the one-hour trip you will travel through spectacular nature, past steep mountains, foaming waterfalls, through 20 hand-dug tunnels into the spectacular Flam valley. Have your camera ready as you might want to take some pictures. The beginning of the route from Myrdal runs through forest, dotted with red and yellow wooden houses. It passes by the Reinungvatnet mountain lake. The track then starts to descend steeply and disappears into the first of many tunnels before stopping at the Kjosfossen waterfall. 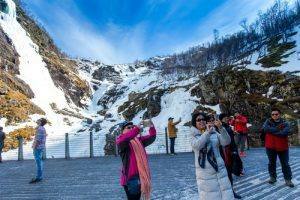 Flam Railway stops at Kjosfossen waterfall and all passengers can disembark the train for a short break on a wooden platform. The waterfall is over 90 metres tall and according to Norwegian fokelore, it’s home to “Huldra”. These beautiful siren women bewitched passing men with their song and lured them out into the woods. Watch out as you might spot “Huldra” dancing in the waterfall. Back on the train, windows cut into the tunnel walls give you flashes of the view down the valley. At Breikvam station the track splits in two so that trains travelling in opposite directions can pass each other. Then towards the end of journey, the gradient smoothes out and the valley opens up. 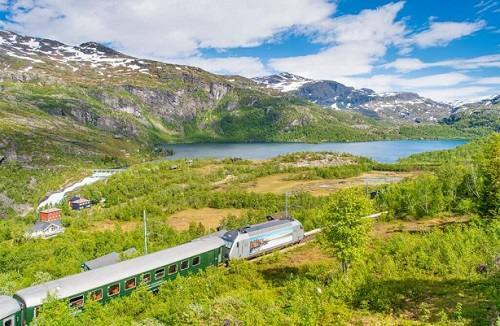 On your arrival in Flam you can also visit Flam Railway Documentation Centre, where you can learn more about the railway´s history and impressive construction efforts. Spend the night in Flam or continue your fjord exploration on board a ferry on one of the Nutshell tours. Do you prefer the winter season? 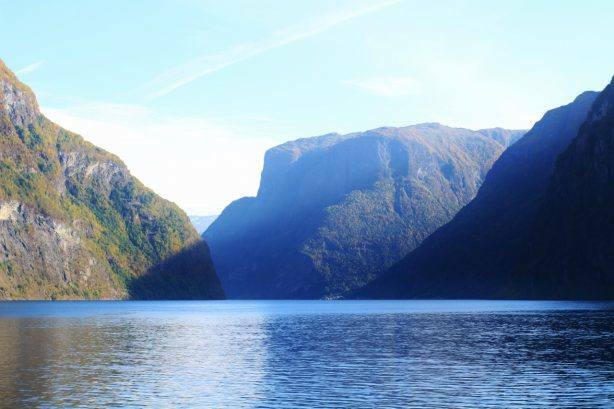 If you would like to travel the fjords outside the peak season, you will have many of the places to yourself!